The final field day for 2012 was held at Clarendon Forest Retreat: a resort of 900 acres with a mixture of accommodation, horse riding and forest. There were 20 people present, and Craig Tate presented the work he has carried out advising the owners on how to manage the forest areas. While in the conference centre we were shown an outline of the 900 acres using the Farm Keeper software. One area has been proposed as a conservation area, since it has significant trees, including a large red cedar that must have been missed by the early loggers. At the other side of the property, 10 hectares were classified as a Private Native Forest (PNF), and we walked through this area identifying the trees, how they were marked as habitat, recruitment, and those to keep, with others marked for removal to allow growth for the retained trees. The diversity of the trees was of interest, including flooded and Sydney blue gum, tallow wood, turpentine, grey gums, iron and stringy barks, bloodwoods and a few grey boxes. Bloodwoods are resistant to white ants but susceptible to burning in fires: something to consider when fencing. After lunch, Ashley Cox, son of the owner, demonstrated the weedicide gas gun that he uses to reduce large infestations of lantana. 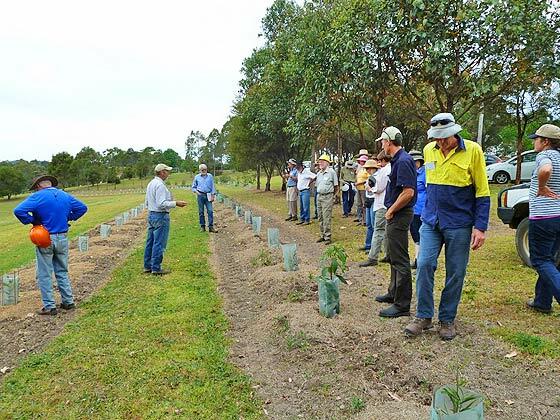 Twenty nine people attended the field day at the Wootton property, considering techniques for native tree plantation establishment. Chris Scott of NSW Landcare and a nurseryman advised of the need for good overall planning, then to select appropriate plants for the site considering its fertility and order seeds and plants well in advance. Site preparation can include ripping to at least 400mm depth to attract and maintain moisture, and weeding. Plant into the rip line in association with rain, autumn possibly being the optimum season. Place plants in a bucket of water just prior to planting to provide adequate initial moisture. Management for another two years is advisable considering moisture, weeds, frost and herbivores – mulch and guards can assist. The group inspected a recently established mixed species native plantation of floodedgum, red gum, tallowood, greygum and brush box, planted along the contour, with a slight fall, using various ripping patterns. “Main” plantings were at 4 metre spacings with a wattle in between to provide a short term nitrogen fix. Growth rates of the plantings, being managed by several different regimes, are being measured as part of the carbon farming initiative. This was a very informative and enjoyable field day. Eighteen HFFN members and friends attended the regrowth management field day at the 640 acre grazing property at Mirannie. Tree types scattered throughout the property include spotted gum, bluegum, redgum. yellow box, grey box and narrow leaf ironbark. A stand of post 1990 regrowth trees, consisting almost entirely of narrow leaf ironbark was inspected and trees for retention were marked with tape. Criteria for retention included biodiversity, dominance, form, edge trees, mature seed source, potential posts and interestingly dead small trees that will fall of their own accord. Some of the trees for retention were pruned using a pole saw and electric clippers on pole, the latter capable of the neater job. Some of the remaining trees were felled by chainsaw. The front wedge cut – bottom cut horizontal and in about one quarter of the diameter and the top cut angled at about 30 degrees; the back horizontal cut slightly above the front horizontal cut; and the resulting hinge of width about 15% of diameter were demonstrated. The final felling act was either pulling from a safe distance by previously attached rope and or by inserting a wedge in the back cut. It was stressed that those planning on felling trees should first attend a reputable course. An electrical chainsaw was used for removing branches quickly from the felled trees. Stumps were then cut off close to ground level to reduce obstacles to later traffic. Any stumps to be left to coppice should be cut horizontal on top about a diameter height above ground level. This was a most informative and enjoyable day. A sunny Sunday at the 1100 acre Upper Myall property was appreciated by 17 people. The day started with discussion of conservation areas and roading and drainage works. Following a tender process with the CMA, a 300 acre conservation area was established for 15 years, during which time no silviculture activities can occur. An upfront payment from the CMA will cover maintenance, including weed control, cattle exclusion, maintaining fire trails. The practical advice was that road slopes be restricted to 10 degrees if possible and culverts rather than rollovers be used for long term reliability. A minimum pipe diameter of 375mm is recommended to facilitate clearing debris. 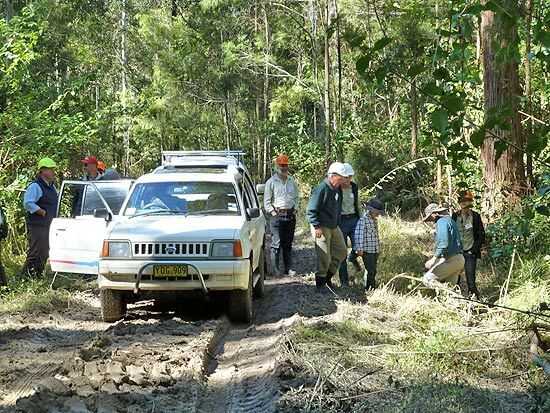 The group then drove through the forest stopping to inspect the conservation area, various road sections and drainage structures, and sites where fence posts had been prepared and boards milled with a portable mill. A notably feature was the change in forest type from the dry ridges to wetter gullies. There was an informative discussion on log pricing. Best price comes from first product ie poles, piles, girders then second product ie sawlogs. The golden rule is that the property owner maintains control of the harvest and sells to a variety of markets. 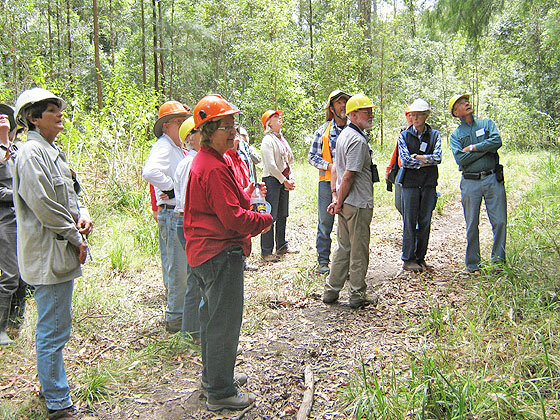 Twenty three people enjoyed fine weather at the Limeburners Creek property with a long history of timber harvesting from the 1860s up to 1963, when commercial harvesting ceased. Clearing for cattle occurred in 1980. The present owner has no cattle and is trialling various regimes of regrowth management. The area has been mapped and includes areas of old growth forest, mainly areas too rugged for earlier timber harvesting. The next stage is to develop a management plan for ongoing forest management. 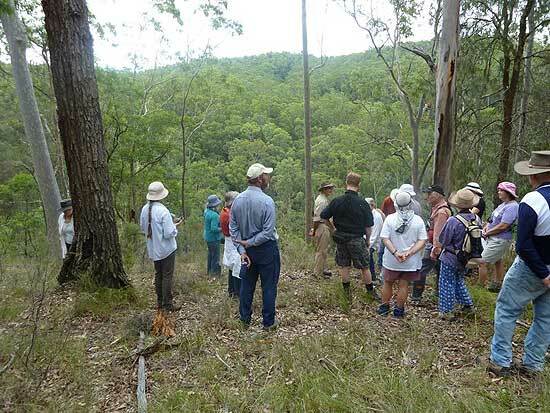 Over 20 enthusiastic foresters attended a very interesting field day in the Upper Karuah valley. There were practical demonstrations of the harvesting machine falling and debarking a tree, the air dried kiln and the milling of a pole into boards. An objective of the property’s management is to educate property owmers on sustainable forestry practices. The harvesting regime is seeking to achieve a balance between production and conservation, and over time have a balanced mix of tree species and age. This involves retaining trees, normally taken by contractors, to grow on for future generations. An important lesson was to find appropriate markets for the processed timber product. In this case timber is being supplied to local, interstate and overseas customers for a range of uses. 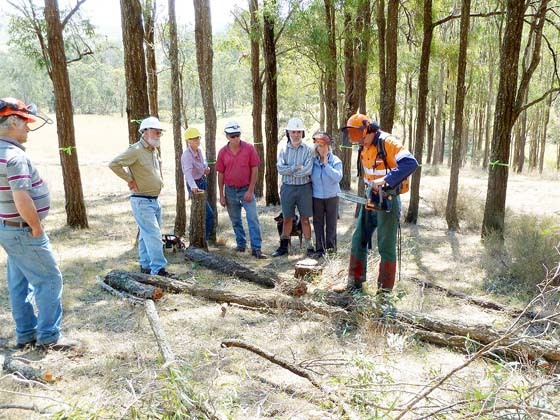 Twenty two people inspected a 80,000 tree plantation, consisting almost entirely of spotted gum, at an Upper Hunter coal mine site operated by Coal and Allied. The forest was established on 80 hectares of land adjacent to the active mine site as part of the greenhouse gas reduction program. Planning and establishment of the plantation was undertaken by Forests NSW and funded by Coal and Allied. Site preparation included ripping and mounding. An initial planting of 47 hectares in Spring 2007 resulted in a 94% survival rate. The second planting in late Autumn 2008 had a lower survival rate; possible causes were frost, attack by hares and kangaroos and dry conditions. A replanting of 10,000 trees was done in 2009. The overall target survival rate has been achieved. An establishment techniques trial area was set up with different plots of deep ripped only, deep ripped and mounded, minimum till, and mounded only, with either nil or appropriate post planting herbicide regime. The trial area is to be monitored over time. Coal and Allied provided morning tea and lunch which were much appreciated by participants. A 100 hectare property at Mount Vincent was inspected by over twenty people. Sixty percent of the property is a voluntary conservation area including endangered ecological communities, a gorge and rainforest and a range of other conservation values. The remainder of the property is being managed as private native forestry with a property vegetation plan being prepared. Significant management issues are coordinating the two major landuses and the success achieved in reducing lantana by the splattter gun approach. A hardy band of HFFN members travelled to the scenic Upper Hunter to inspect two properties over two days. A common theme was the effect of extreme events on trees. On the first property, located in high, steep country in the Upper Rouchel Brook valley dominated by stringybarks, fire moved through the area over a two week period in November 2009. The trunks of most trees were blackened and epicormic growth was much in evidence. While some trees were destroyed, the majority appeared that they would survive with only a small amount of long term damage. An obvious management strategy is to keep debris away from the base of trees to reduce the possibility of fire reaching the crowns. Back burns to protect assets can be more effective if done just prior to the threat. If done too early, litter has a chance to re accumulate. 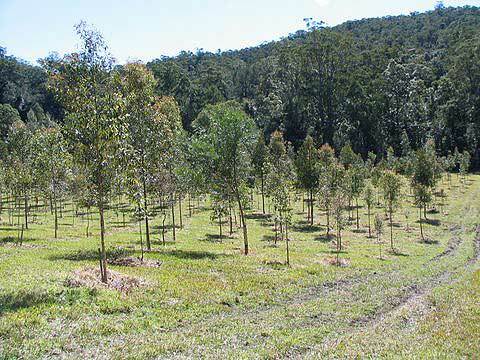 At the second property, located in the Martindale Creek valley, plantations of over 3000 trees, including spotted gum, ironbark, grey gum, slatey gum, white box and casuarina have been established. Typical tree spacing is 4m x 3m. In addition to frost and wallaby grazing, drought had a profound effect on the success rate of the plantings. There is an extensive area of ecologically valuable slatey gum on the higher country. Management lessons include: planting must be timed to the local seasonal conditions; ripping along the contour to retain runoff was effective on the higher and dryer areas, however the rip line soon disappeared on the alluvial flats; keep plantings away from established trees that are sucking up the moisture; initial planting of wattle and casuarina can assist the growth of eucalypts interplanted a bit later. The landowner’s overall conclusion is that plantations are useful as windbreaks, but management of regrowth is a better option for timber production. Beautiful weather and the picturesque setting of the Upper Karuah Valley made for an enjoyable day for the nearly 40 people who attended the August field day on two adjacent properties. On the first property, a three year old plantation of some 1500 trees of mixed species, most endemic to the local area, was inspected. Tree spacing was generally 4 metres and some trees had reached 6 metres in height. Factors affecting growth included moisture distribution and shading from adjacent forest. 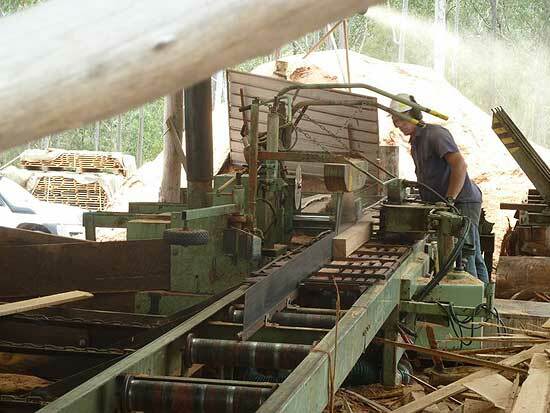 A Mahoe twin blade transportable mill is used for milling single selection trees from the property’s native forest for rural fencing products and small quantities of flooring, decking and palings. A forest management plan of the second property was presented. This details the composition and condition of the forest, recommended silviculture regimes and possible products. Part of the property containing single age forest, resulting from previous clearing, was inspected and appropriate management to encourage species diversity was discussed.